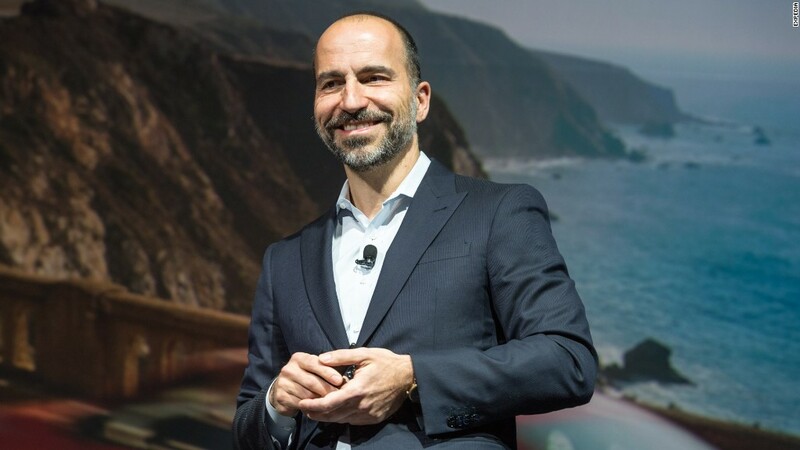 CEO Dara Khosrowshahi says Uber is "just getting started" when it comes to improving diversity and inclusion. On Tuesday, the ridehailing behemoth released its second annual global diversity report following a tumultuous 2017 that put its corporate culture under the microscope. Uber has made some slight improvements when it comes to diversifying its workforce in the past year, but its far from time for the company to celebrate. "Frankly, I don't think we know what 'good' is yet. We know what 'better' is and we want to get better," said Khosrowshahi in an exclusive interview with CNNMoney. The report, which looks at Uber's global workforce from March 2017 to March 2018, revealed that just 18% of its technical workers -- such as engineers and IT specialists -- are women, up from 15% the year before. For comparison, Facebook's percentage of women in technical roles is 19%, according to its most recent diversity report. Khosrowshahi said the company didn't set specific goals for the future, something that is relatively standard among other tech firms that release annual reports. But that's something that may change in the years to come. "... To define a goal at this point would be too soon," Khosrowshahi said. "Goals are easy, actions are hard ... Judge me based on what I do, not by what I say." The former CEO of Expedia joined Uber, the most valuable privately held startup in the world, in late August. Uber also reported a slight gain in black tech workers at the company, up 2.6% from 1% (Facebook has 1%). Overall, 8.1% of Uber's workforce is made up of black workers -- down from 8.8%. The company's EEO-1 report, which it also released, looks at its US workforce from December 2016 to December 2017. As Uber added nearly 3,500 U.S. employees, the percentage of women employed jumped from about 30% to 33%, the report indicated. "The hard work is the work that you do when you build a diverse slate of candidates, sitting down with someone and developing their career and moving them around the company," Khosrowshahi added. The company said it has changed its interview processes to mitigate bias and reworked more than 1,500 job descriptions to ensure they're using inclusive language. About 7,000 employees (up from 2,000 employees) now engage in various Uber employee resource groups such as Women of Uber and Black Hue. Still, Khosrowshahi said the company's diversity "needs to improve across the board." One area in particular? Hiring or promoting more diverse leadership. Overall, women in leadership roles at Uber went down one percentage point to 20%. Uber's women in tech leadership increased by more than 4% to nearly 16% but it still doesn't haven't any non-white, non-Asian tech leaders. "While we've made some good steps as it relates to diversity at the company, we want that to be reflected in the senior leadership as well," Khosrowshahi said. Liane Hornsey, Uber's head of human resources, echoed the notion that there's still work to be done. "I want to be very clear that we're at the start of the journey -- and [diversity] is not something we think we can become amazing at really, really quickly," she told CNNMoney. Rewind to February 2017, a blog post written by ex-employee Susan Fowler shined a light on sexual harassment and sexism at the company. After lengthy internal investigations, its co-founder Travis Kalanick was pushed out as CEO in June. "The company was pretty traumatized," Hornsey said. "When you're traumatized, you need to feel like you're going through a process of getting better." Hornsey said she is proud of the company's recent wins. Uber said in August it adjusted salaries to ensure all employees -- regardless of gender or race -- are paid equally based on their location, job and tenure in the role. Uber also recently re-evaluated employee salaries after bonuses were paid out in March. "I'm over the moon that after going through our salary review this year, we've retained our equal pay," Hornsey said. Hornsey counts the recent hire of Bo Young Lee, Uber's first head of diversity and inclusion, as another important move the company has made to improve its diversity and culture moving forward. Notably, Uber was rejected by two important diversity devoted organizations that refused relationships with the company in 2017. AnitaB.org, previously known as the Anita Borg Institute for Women and Technology, cut its partnership with Uber last May over the high-profile allegations of sexism at the company. Several months later, another nonprofit -- Black Girls Code -- rebuffed Uber's $125,000 grant offer. Lee, who wasn't at Uber when those events occurred, describes them as "blessings in disguise." "As much as it hurt ... it added to the data," Lee said. "It provided critical feedback [that showed] this is how you're being perceived; this is the amount of work you really have to do." Prior to the report's publication, CNNMoney reached out to AnitaB.org for comment. President and CEO of AnitaB.org Brenda Darden Wilkerson called on the company to publicly release plans to show how they plan to increase their diversity numbers, and how they plan to retain and advance those in technical roles once they're hired. Despite outreach from Hornsey to AnitaB.org to introduce Lee, Wilkerson said the organization "will remain resolute in our determination to see solid evidence of real change at Uber before we are willing to re-engage with their leadership."